Helping kids cope with military relocation. Relocating is hard for any kid, but it is especially difficult for kids in military families. For them, moving multiple times in a short period is a standard part of life. They have to uproot and learn to make new friends over and over again. For some kids the ability to start over in a new place is alluring, but for many it's extremely stressful and can cause behavioral and emotional problems later on down the road. On the bright side, there are many ways you can help your children cope with military moves. Maintain a positive relationship with your child. 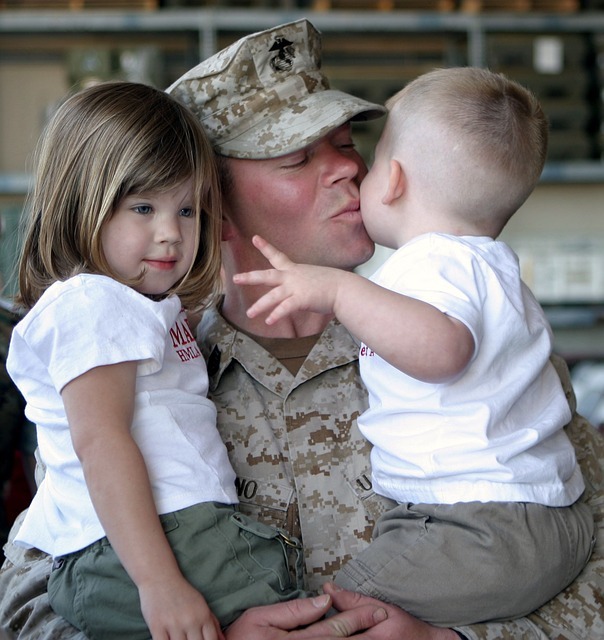 In a 2003 study published by Military Medicine & the Association of Military Surgeons, research showed that one of the biggest factors in children's ability to cope with military relocation, is their relationship with their parents. If you have a close relationship with your kids, you can be a buffer between them, their anxiety, and any loneliness they may experience during and after a move. Having a positive attitude about military life in general will help guide your children's feelings and ease the transition. Explain how the move will work. Give your kids as many details as you can about where the military is sending you and why. Tell them how long it takes to get there and where your new house will be. If you are moving to a base, tell them the name and explain your job there. Let them know when you will be moving and how you are travelling. Make sure that your kids understand that the whole family is moving together. This will ease some of their fears of being left behind, especially if they have already experienced a parent's deployment. Give your kids enough time to say goodbye. For kids, one of the hardest parts about moving is leaving their friends and families. Schedule play dates so your kids know they will get to see their friends before they leave. Have them explain to their friends where you are going and why. If their friends have a positive view of the move, it will help them be more optimistic, too. Encourage them to exchange contact information so they can stay in touch. If this isn't your first move, have your children reach out to some friends who went through another move with them. If they can get through that one, they can get through this one. Allow your kids to help with separating and packing. This will make the move seem gradual, instead of just packing them up and leaving. Let your kids help you decide what to give away and what to keep. Have them sort through their own belongings to keep them involved. Make sure they have their favourite toys ready to take with them. Travelling with comforting belongings will make them feel more secure about the move. Give your kids special jobs on moving day to make them feel like a valuable part of the move. This will also shift their focus onto the job and off of leaving. Let your child decide how to decorate his or her new room. Have your children draw pictures of what they want their rooms to look like. Let them imagine their dream rooms. Even if you ultimately can't accomplish everything, it will make living somewhere new more exciting. If you can, show them pictures of the whole house so they will know what to expect and where they will fit. Explore the new neighbourhood together. Go on an adventure around your new neighbourhood. Make sure your kids get familiar with your street. Teach them their new address and phone number as soon as you get there. Let them see their new school and if they're old enough, show them the route to get there. Take them to the base you'll be working on and show them your job. Let them see firsthand why you had to move. Make an extra effort to find after school activities and groups that appeal to their interests. Making friends outside of school will make socializing in school easier. For many children in military families, moving often is just a part of life. Helping ease the transition now will give your kids the tools to cope with future relocation.